Currahee District Roundtable is held on the 2nd Thursday of each month, at the Clarkesville United Methodist Church, from 7:00 PM - 8:30 PM. 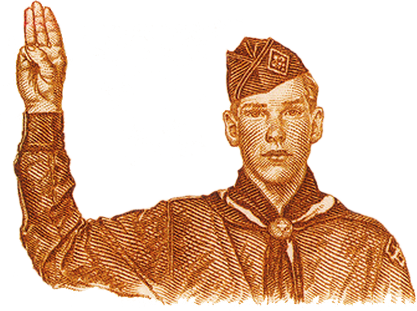 Roundtable starts with a general assembly and adult recognition from 7:00 PM - 7:30 PM and then we separate into Cub Scout, Boy Scout and Venturing Roundtables. Come a few minutes early and enjoy a time of fellowship with your fellow scouters. Roundtable is held monthly for the purpose of giving adult leaders supplemental training to feel confident in their ability to deliver an exciting program to our youth membership. Here you are offered the chance to connect with your fellow Scouters for the purpose of sharing ideas, issues and/or making connections such as Pack - Troop connections. Roundtable may also serve serve to renew each Scouter's enthusiasm and dedication. All Adult Leaders who hold any position within their unit are invited to attend. Learn about resources, meet other leaders, swap ideas, and get the latest information on district and council events. Have an Idea for a Roundtable Discussion? As time is limited during our general session, if you need to make an announcement, please email the Roundtable Commissioners above. We also encourage you to bring a display board and/or flyers to pass out.